The Clone Wars celebration that wasn't. Pretty much as stated, where was it? The clones getting their helmets was great (personally I asked for them over and over and over) but why no reworks? Even all 5 at G12 is a weak squad. No new clones? No zeta on GK that could help them out? No new Separatists? No General Grievous rework? No Jedi reworks, specifically Anakin and Mace? What was the point of putting those Clones packs in the store if they aren't anything above a D grade squad, not getting a rework or any additions? What was the point of making Grievous larger in the game? Anakin has that Galactic Hero tag in the Sith Raid, which he's basically worthless in, yet all we got was his ship? Great ship but should have been and also-ran with his rework. I'm not certain if you all at CG/EA saw the enormous amounts of fan jubilation that went on when the next season of Clone Wars was announced, or if you paid attention to Reddit or these here forums when the CW hype was building, but I think you horribly misfired here. More KOTOR toons (I love KOTOR for the record) are nice but should not be THE thing happening right now. They should be tossed in, even if it means I'm getting Darth Malak and Darth Revan soon. This all seemed rushed at the cost of dealing a pretty big blow to the community. Edit: Also, what was the point of those Clone Wars bonus shard drops? First of all their drop rate was beyond low. Maybe the lowest ever in this game's history. Second, what were they for? Again...no reworks to ANY of them. CLONE HELMETS!! Now let's get Sabine her epic helmet. They would have been better off doing nothing regarding the Clones, rather than just tease. Yeah. All the Clone Wars stuff was a big tease. Missed opportunity is what is boils down too. Yeah, at the cost of a huge letdown to the community. I agree. I guess they figure they can make more money off KOTOR right now than TCW. Yeah, they saw what Revan got them, and now they want to double that with a second version. I'm that one guy who did that one thing! Maybe? They want to generate revanue every fiscal quarter. Who on earth decided to celebrate Clone award by areleasing more Kotor toons? Half the community has no attachment to this era and we drag it on for another 3 months once the dark side KOTOR event comes... this is just pathetic. On a positive note they must be getting ready to celebrate Clone Wars content once the new season comes. 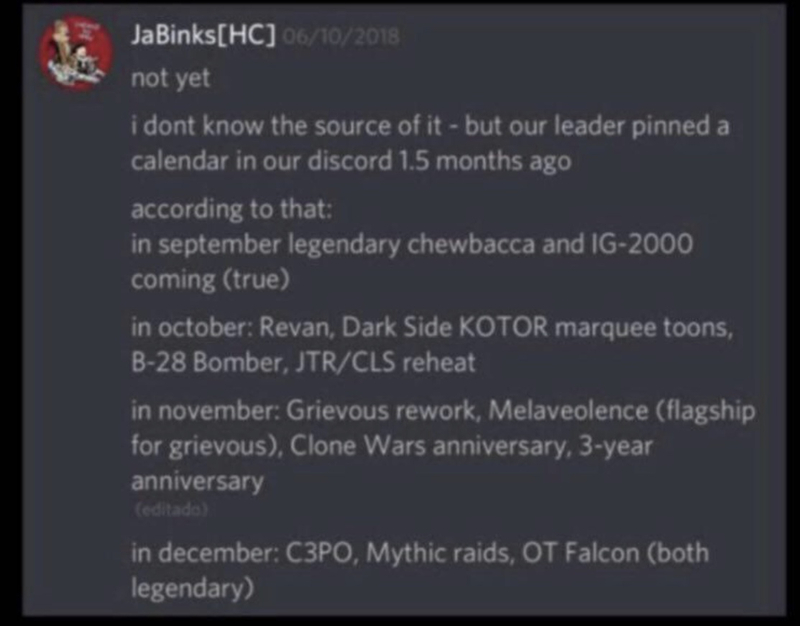 But at this point I’ve lost faith in CG giving us anything the community wants like Clone War era love, a new Grievous Capital ship, a Death Star ship raid, LIVE PVP arena. Yeah, which is fine. And why I said these other KOTOR toons should have just been added in addition to the Clone Wars stuff. One could easily argue more people love the Clone Wars over KOTOR, and they would shell out more money for additional clones and Separatists. Specifically clones people have been asking for, or droids like Droideka. That's all well and good but that's a year away for the new season. Everything will have its turn eventually. I'm more than certain that when the new clone wars show comes back on we will get more content/reworks. There are probably bigger things at play right now than clone reworks.. I'm just gonna say that GK is the ONLY raid/legendary character that doesn't have a zeta. He's a really great tank, but he's kinda getting phased out. Some jedi teams don't even use him. Yeah, exactly, that's why I said a zeta to help out the Clones, since this version of Kenobi lead clones into battle. The Kenobi that's on the splash screen, Jedi Master (which I assumed was also gonna be added), would have zetas for Jedi. When the Final season of Clone Wars is released they’ll probably celebrate it by releasing even more Kotor toons. So I’m predicting much more Kotor content to come. I’d honestly rather them have done nothing than give us false hope. This looked exactly like it was a teaser for the big clone wars faction pass that literally everyone has been asking for for years. We all thought that since EAs battlefront 2 was doing clone wars, and that this was the 10 year anniversary that we were gonna get a big treat... I’m increasingly being let down with each update. There were leaks, so CG changed up the order of what they were going to release. All the Clone Wars era stuff got switched to another quarter. CGCarrie said the GG rework was speculation from leaks, which to me says the leaks were right, at some point in time. If the leaks weren't from a legit source, they wouldn't have reacted to strongly. Have anything to do with GC program??? All the leaks are exactly what they’re doing right now... look at the image below. We know exactly what is going to happen Darkside Kotor toons are not a surprise. Those leaks weren't gonna really hurt their bottom line. This game makes like 13 million on average per month. And a Grievous rework wouldn't really garner them money anyway, but the addition of marquee droids like Droideka that go hand in hand with a GG rework would have DEFINITELY made them money. Edit: In addition to the above points...it seems like they switched up their schedule to spite the leaker(s) but in the end it that's not how it went down. That move hit the community, not the leaker.